As the summer time approaches, the temperature goes up. There is no better time to grab a nice cold soda, fruit juice, lemon aid or a wine spritzer. But be careful, many of these summer drinks can be harmful to the teeth. 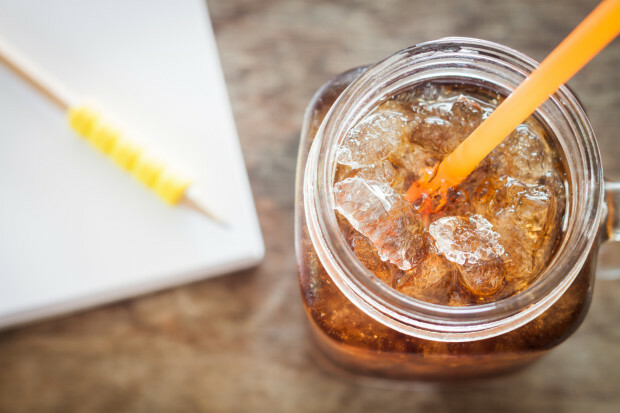 We’re not necessarily talking about sugar, which can lead to tooth decay, but something not often appreciated – acid erosion. The teeth are made up of enamel (the strongest substance in the body) and underneath that is dentine. Dentine is still strong, but not as tough as enamel. Saliva protects the teeth from acids in the diet. It also contains substances that can help neutralize the acids found in many drinks. Normally, saliva functions as a “bathing” solution around our teeth, being strongly saturated with calcium, and phosphorus. These mineral ions are there to protect enamel and teeth from weakening due to acidic attacks that can cause demineralization. They are ready to rebuild enamel in this constant exchange process and strengthen the teeth’s hard structures. Damage can occur if acidic attacks are too frequent, the acidic environment prevails, and saliva does not have enough capacity to aid in neutralization. The teeth are subjected to tooth erosion, increased tooth wear, and in the presence of bacteria, tooth decay. Which Summer Drinks Are Acidic? You name it. Flavored water, Gatorade, Powerade, energy drinks, and even vitamin water all have a low pH and are considered acidic. Fruit juices such as lemonade, orange juice, and cranberry juice, are also very acidic. Most wines are also in the low pH range and are considered acidic. And sodas? Forget about it, they are among the most erosive of all the drinks because they also contain phosphoric acid and citric acid. Well, the good news is that it is OK to have one of these beverages now and then. However, to counteract the acids they contain, have a glass of plain water as well, or rinse the mouth with water afterward. That way the mouth can return to its natural protective pH and the teeth are protected. To find out more about how to care for your teeth, visit preserveyourteeth.com and enjoy the summer. Cheers!